Tinsel Christmas Pop-up Bar will take over the former space of Simpson's Jewelry, located next to Finn McCool's. First, Nick Elmi's ITV got a holiday makeover, complete with stockings and festively-named cocktails. Now, a new Christmas-themed bar – decorated top to bottom in twinkling lights – is opening in the city for a limited time. 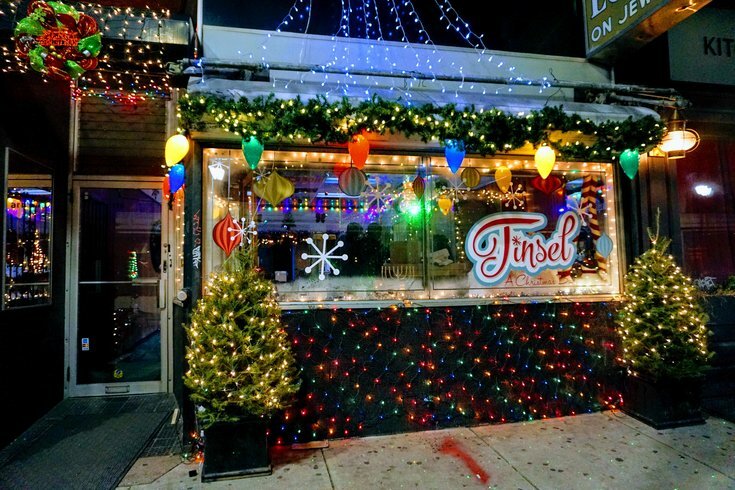 In the space formerly occupied by Simpson's Jewelry, next to Finn McCool's, will be the Tinsel Christmas Pop Up Bar. It's set to open tonight, Dec. 8, at 5 p.m. Inside the space, there are three rooms decked out in festive decorations. Over the former diamond safe is a glowing fireplace art installation. In the front window is a toy train. On the wall is a custom Krampus mural. Guests can sit at the 25-foot bar along the former jewelry counter, or on the 12 bar stools at the main bar and order festive drinks. Tinsel will offer a full selection of liquor and spirits to make Christmas cocktails, and will serve speciality Christmas beer on draft like Troegs Mad Elf, Hardywood Bourbon Gingerbread Stout and Chimay Grande Reserve. The Christmas cocktails, $8-$10, will rotate each week throughout the season. To eat, there will be Christmas cookies, appetizers, sandwiches and holiday specials. Tinsel will be open Tuesdays through Thursdays from 5 to 10 p.m., Fridays and Saturdays from 2 p.m. to midnight and on Sundays, noon to 5 p.m. There will be happy hour specials during the week 5-7 p.m.
Tuesdays through Thursdays 5-10 p.m.
Sundays noon to 5 p.m.